In our appearance-obsessed society, eating is about much more than hunger and sustenance. Food inspires pleasure and anxiety, shame and obsession. We are constantly judged on how we look, so we’ve come to judge ourselves (and others) on what and how we eat. Joyce Maynard writes about learning to make pie with her complex but adored mother. Caroline Leavitt’s chilling piece describes the overlap between power and eating. Ophira Edut explains how an outspoken “body outlaw” wound up on Jenny Craig. Diana Abu-Jaber writes about abandoning her Bedouin customs for America’s silverware and table manners–and missing the physical, hands-on connection with food. 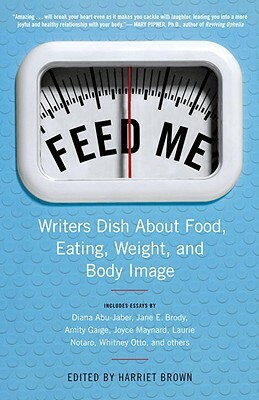 Exploring the bonds between appetite and remorse, hunger and longing, satisfaction and desire, this anthology is for every woman who’s ever felt guilty about eating dessert, or gushed over a friend’s weight loss, or wished she had a different body. Harriet Brown is the award-winning author of The Promised Land, a collection of poetry; Feed Me! : Writers Dish About Food, Eating, Weight, and Body Image; Mr. Wrong; and The Good-Bye Window: A Year in the Life of a Day-Care Center. Her poems have appeared in Poetry and Prairie Schooner, among other literary magazines. She is a frequent contributor to The New York Times and other national publications. She lives with her husband and two daughters in Madison, Wisconsin.